We just got back from Las Vegas! We went with Matt & Staci - We had so much fun!!! We spent 3 nights at the Mirage hotel. 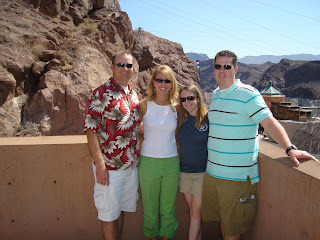 On Thursday, we went to the Hoover Dam - that is where this picture was taken. Friday Steve and Matt played golf, while Staci and I shopped, ate at The Cheesecake Factory, and spent time out by the pool. Friday night we ate at the buffet at the Wynn hotel... we ate more Alaskan King Crab legs than we could count! But the best part was just being able to hang out with our buddies again! It was a super fun trip!